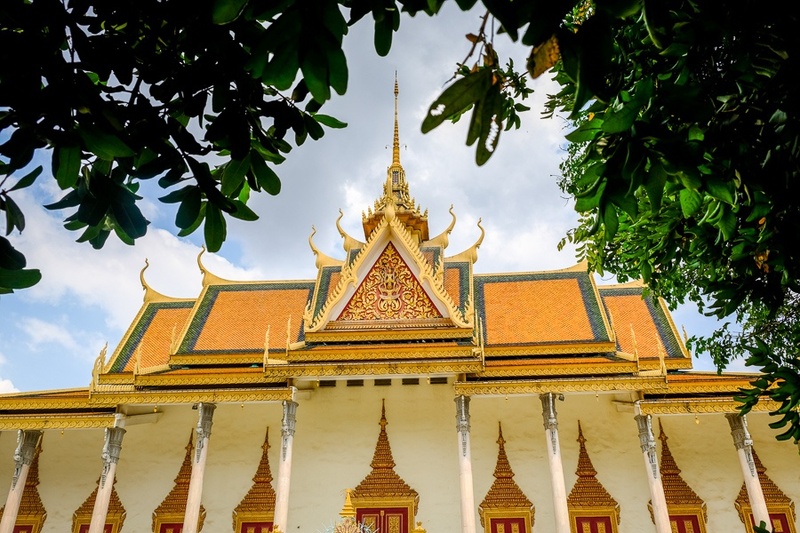 Phnom Penh doesn’t have a whole lot of things to see and do compared to other capital cities in SE Asia like Bangkok or even Vientiane, but one exception is the Phnom Penh Royal Palace. 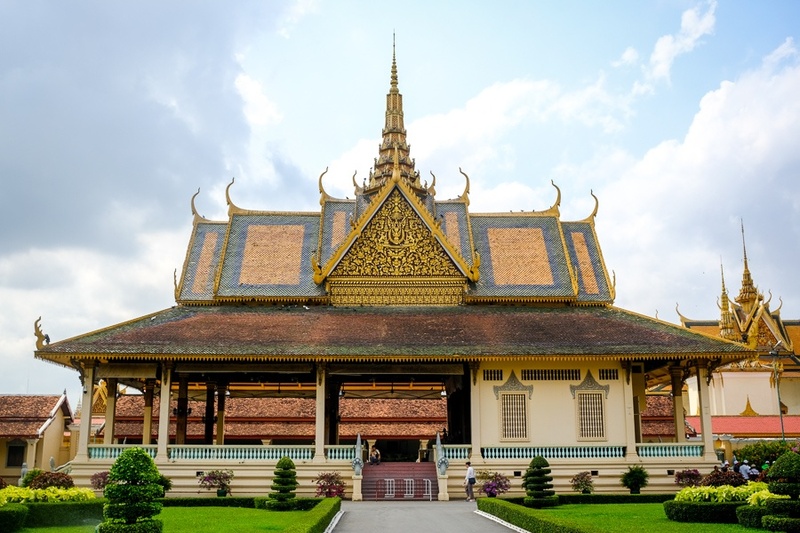 It covers a big area near the riverfront and has more than a dozen fancy palaces, shrines, and stupas to check out. 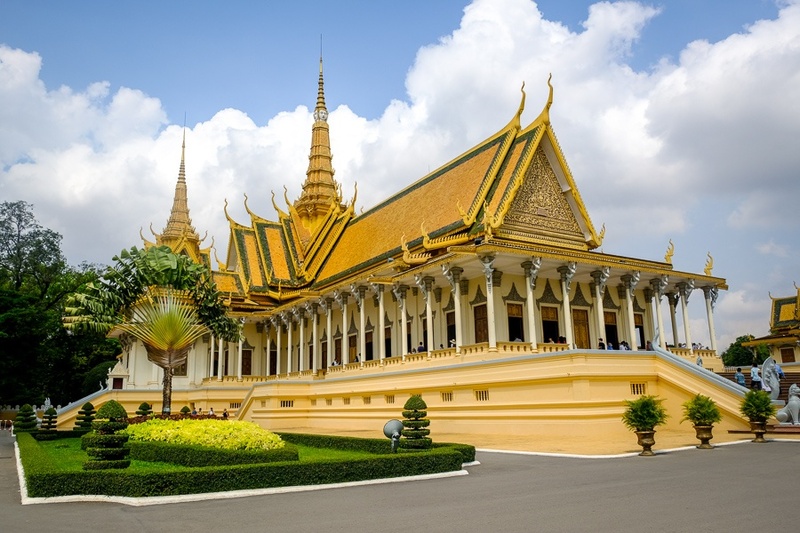 The Throne Hall is the main building of the Royal Palace. It was built in 1863, but it’s still used sometimes for religious and royal ceremonies. Sadly you can’t go inside, or take photos inside. But you’re allowed to peek in the windows, and the staff didn’t really seem to monitor people taking photos through the windows. Still, the best photo ops are when you walk around the outside of the building and take in the stunning architecture of the rooftops. It’s quite a view. 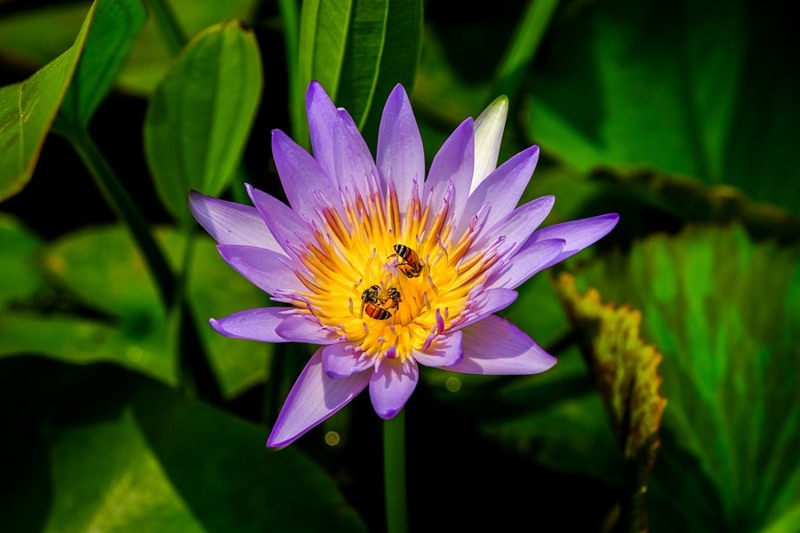 The best time to photograph it is in the morning. The crazy Cambodian style rooftops. Love it! 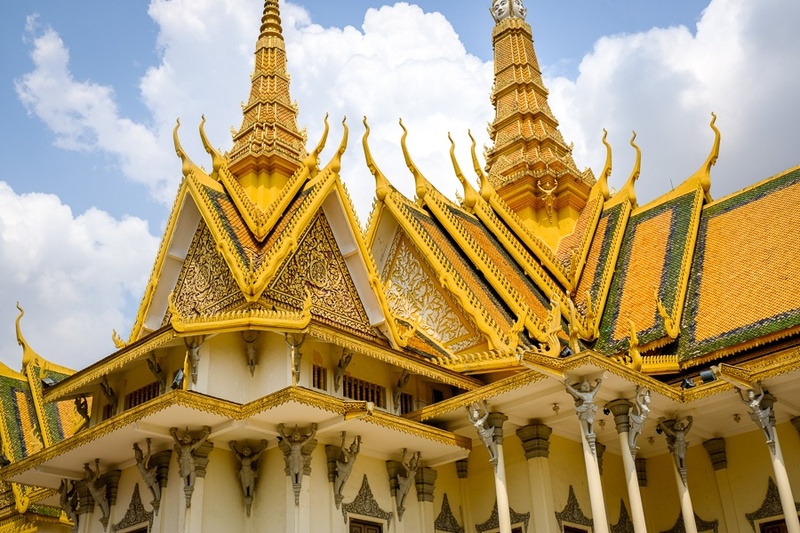 One of the highlights of a visit to the Royal Palace is the Silver Pagoda. This is part of the same palace grounds, and it’s included in your ticket. 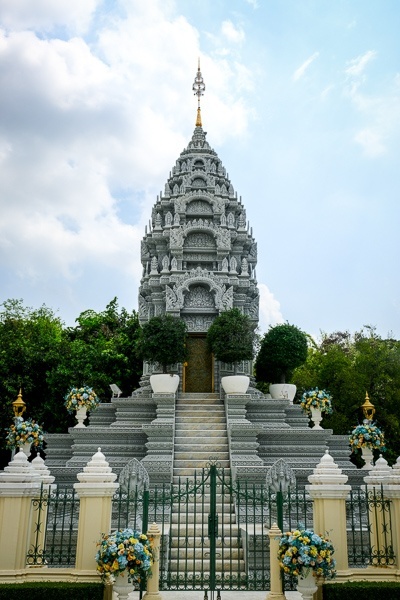 The Silver Pagoda (aka Wat Preah Keo) was first built in 1892, but then it was expensively rebuilt in 1962 with a massive amount of gold, silver, and diamonds. 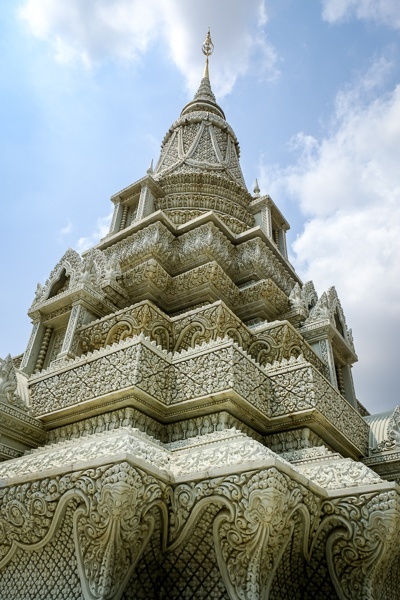 The name of the pagoda comes from the silver floor inside, which has almost 5,000 silver tiles weighing over 5 tons. Photography is not allowed inside the building, but the outside is really amazing and it’s great for photos at any time of the day (I went in the morning). There are lots of other smaller buildings in the palace grounds that you aren’t allowed to go inside, but they’re still worth checking out. 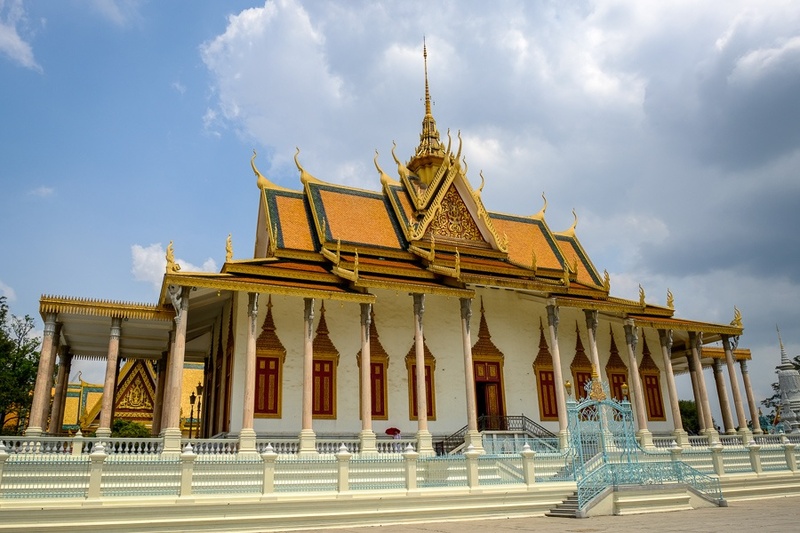 A gated grey stupa has the remains of the 20th century Cambodian king, Norodom Sihanouk, and there’s another white stupa dedicated to King Ang Duong. There are lots of neat buildings here, so I do recommend exploring everything before you move on. Hiring a guide is optional, and the cost is per group. It’s a bit pricey, but as a solo traveler you can try joining a group if you want to have a guided tour at a more reasonable price. The dress code here is a bit strict since it’s a shrine, so you’ll be required to wear clothes that cover your knees and shoulders. They’re serious about this. A shawl or scarf is not allowed, so you need a shirt that actually covers your shoulders. Shorts are allowed as long as they go below your knees. If not, you may be asked to buy a T-shirt or trousers from them for $3 each. 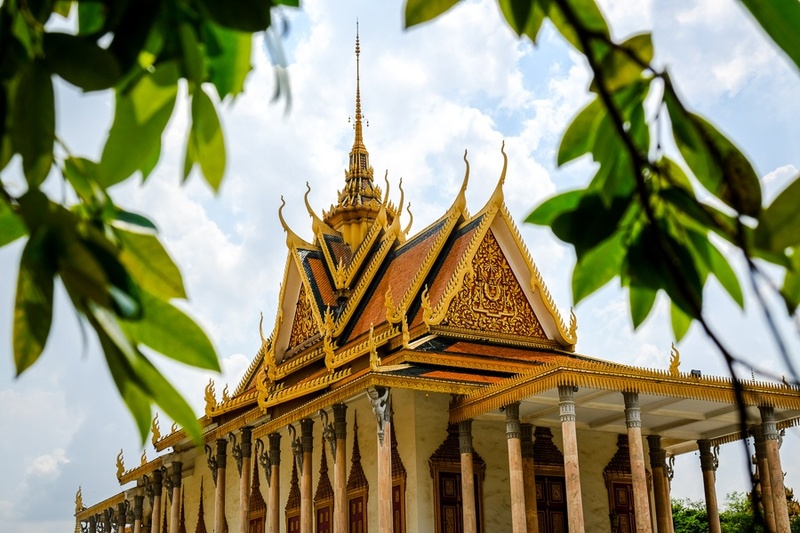 The palace is located in the Phnom Penh city center, near the riverside. You can get there by tuk-tuk or car taxi, or better yet, you can walk to it from some nearby hotels. I stayed at a guesthouse by the riverside that was just a 5 minute walk to the Royal Palace. No tour or taxi needed!